If you've ever looked up on a dark clear night, you've probably seen the Milky Way, a faint, hazy stream stretching across the sky. Familiar to humankind since ancient times, its nature wasn't known until Galileo turned his telescope toward it and discovered that it is composed of countless faint stars. In fact, the Milky Way is the visible marker of a great system in which our solar system is located: a galaxy made up of 100 billion stars and vast amounts of gas, while the 500 or so individual stars visible to the naked eye represent just a handful of our closest neighbors. Our galaxy is shaped something like a pizza, and our own star, the Sun, is located in a piece of pepperoni halfway out toward the crusty edge. This is why from our perspective, we see a band of light wrapped around the sky. Spiral galaxies are like our own Milky way: flat, gas-rich systems with prominent spiral arms. Examples include the nearby Andromeda Galaxy, the Sombrero Galaxy, M74, M83, NGC 1232, NGC 4622, M33, NGC 6946, NGC 7331, NGC 1365, M51, NGC 3310, M95, NGC 3184, NGC 2841, M64, NGC 891, NGC 1300, M100, M96, NGC 2336, NGC 3627, and M101. Elliptical galaxies are rounded, featureless balls of stars. Some examples are M87, NGC 1316, and NGC 4365. An elliptical galaxy and a spiral galaxy next to each other can be seen here. A group of two ellipticals and one spiral are here. On a larger scale is the Coma Cluster, a huge swarming mass of hundreds of ellipticals and spirals. For more information about galaxies, see here or for more photos, see here and here. One of the more astounding findings of late 20th century astronomy was that there is much more to the universe that meets the eye. All the visible matter we can see (stars, gas, dust) makes up only about 10% of the material in the universe. The rest, dark matter, is a material (or several different kinds of materials) of a nature still quite unknown. Being "dark", it has so far never been directly seen, but its existence is inferred--mainly from its gravitational effects. But what about elliptical galaxies? Do they have dark halos? And if so, are they similar to spirals' dark halos? Yes, according to the theoretical picture above, but empirically, these questions have been unanswerable because ellipticals don't have cold gas which can be measured. Some other way is needed to probe for dark matter. There are in fact some objects around elliptical galaxies which can be studied, albeit much more difficult than it is with cold gas. These include globular clusters and planetary nebulae. If one can measure the velocities of such objects in sufficient numbers, one can tell how strong the gravitational forces are around the galaxy, and thus how much dark matter there is. Around every galaxy, including our own Milky Way, there are numerous smaller stellar systems called globular clusters. These are dense balls of "only" about a million stars each, and are the oldest known objects in the universe. Some examples of globulars lurking around our galaxy are NGC 6093 Omega Centauri (also with close-up), M92, NGC 6397, 47 Tucanae (close-up here), M15 (also with close-up), NGC 1916, and NGC 5904. (To take a virtual tour of the Milky Way's globular cluster system, see here. For more information about globulars, see here.) These dense collections of stars are visible in distant galaxies when indiviual stars are not. See M87, where most of the "stars" in the image are not stars at all but globular clusters swarming around the central galaxy. It is possible to measure the velocities of such globulars given a large enough telescope. The name planetary nebula is misleading -- these nebulae have nothing to do with planets (when first discovered with small telescopes, their typically round appearance made them look like planets, hence the name). They are the cast-off remnants of aged, dying stars -- shells of gas lit up fluorescently by the central ember's fading rays. For a more detailed explanation, see here or here. For observing information, see Planetary Nebulae Observer's Home Page. An example of a planetary nebula (PN) is the Eskimo Nebula You can see the remarkable difference in resolution between this spaced-based telescope image and this ground-based telescope image. Others include the Cat's Eye Nebula (also with X-ray and optical emission superimposed), the Hourglass Nebula, the Dumbbell Nebula, the Ring Nebula, the Ant Nebula, the Southern Ring Nebula, the Spirograph Nebula, NGC 6751, the Retina Nebula, the Red Spider Nebula, the Helix Nebula, (also here, with close-up of "cometary knots" here), M2-9, the Rotten Egg Nebula, NGC 2440, the Snowball Nebula, Abell 39, the Butterfly Nebula, the Stingray Nebula, and NGC 7027. 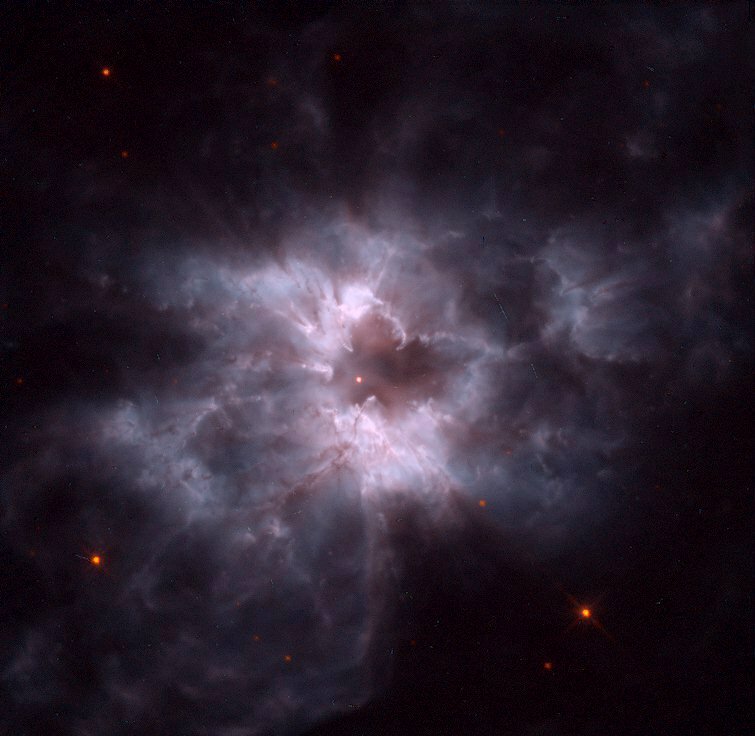 A whole gallery of PN images from Hubble Space Telescope can be found here, and a ground-based gallery here, and a false-color one here. Three examples of a "proto-PN" are the Egg Nebula, CRL 618, and Gomez's Hamburger. Because these PNe fluoresce, they emit their light with a few well-defined colors, and so with the use of appropriate color filters, the contrast between a PN and the background light can be increased, and thus they can be observed in distant galaxies, and have their velocities measured. I have made many trips to some of the world's largest telescopes to measure the velocities of extragalactic PNe. Two such "observing runs" are described here and here. I am also heavily involved with a new instrument specially built for this purpose, the Planetary Nebula Spectrograph. In addition to observing the velocities (kinematics) of these "halo tracer" objects, I also work on the dynamical modeling necessary to interpret the data. That is, I calculate how much dark matter there is, try to understand the internal motions of the galaxies, make inferences about their formational histories, etc. If you want to know the gory details, you can see here. Now for the bottom line: what about results?? Our work on bright elliptical galaxies like M87 and M49 has turned up a lot of dark matter, as expected. However, with some of the first studies ever of "ordinary" ellipticals like NGC 3379, we got a bit of a shock. In these galaxies, we've found that the PN velocities fall off quickly with radius, as though there are no extra gravitational forces at work - and thus no dark matter! Below are some images that show this. First is NGC 3379, with PN velocities shown around it. Blue dots show PNe which are moving toward us (Doppler blueshift) and red dots are moving away (redshift). The dot sizes are larger for larger velocities; you can see by eye that the dots (and velocities) get smaller away from the galaxy center. Second is a plot of the velocities with radius for four different galaxies, superimposed on the same plot. The yellow dotted line shows the prediction if there's no dark matter, which matches up quite well with the data. So in these cases the "missing mass" is missing: what you see is what you get. Since these systems aren't enveloped by the "normal" cloak of dark matter, we call them "naked galaxies" - although they might not actually be naked, but only scantily clad, since we can't rule out a small amount of dark matter. Why are these galaxies naked? There are lots of ideas (e.g., they've lost their dark halos through interactions with other galaxies), but none of them seems to work so far. At this point, we'll continue gathering data on different galaxies, and analyzing them, so stay tuned. If you'd like to know still more about the history of the universe, see Ned Wright's Cosmology Tutorial. For an entire basic astronomy overview online, see Astronomy Notes. For still more spectacular astronomical photos, see the Anglo-Australian Observatory or the Hubble Space Telescope.